Coves del Drach or the Dragon Caves are located on the east coast of Spanish owned island of Majorca in the Mediterranean Sea. 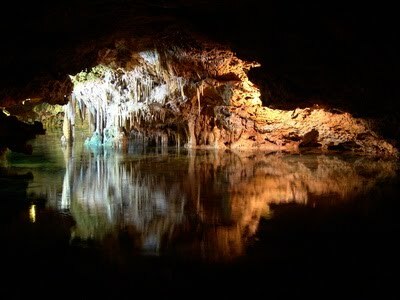 They consist of four great caves - White Cave, Black Cave, Cave of the French and Cave of Luis Salvador. They are all internally connected to each other. They are up to 25 meters deep and stretch for 2,4 kilometers. Inside there is also an underground lake, Martel Lake, which is considered to be of the largest subterranean lakes in the world. Since 1935 a concert has been performed at the sea every day. It consists of four pieces of classical music played with violin, cello and harmonica. One may also have a trip on the sea by boat. And there are organized tours of the caves. 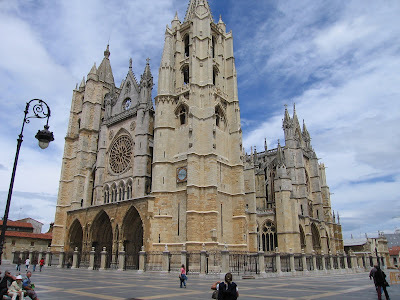 Dedicated to Santa Maria de la Regla, the León Cathedral is a masterpiece of Gothic architecture. It has almost 1,800 square metres of stained glass. Most of it is original and date back to the 13th and 15th centuries.